Fair Isle Bird Observatory: the Warden's diary: What. A. Day. 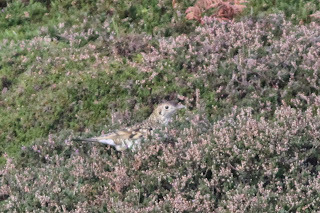 An Olive-backed Pipit (I know it isn't a BBRC species anymore, but it still deserves red font I think) at the Obs before breakfast caused a bit of a scramble to get everyone to see it – but it was quickly forgotten as somewhere in the melee came the shout of ‘WHITE’S THRUSH AT THE GENERATOR’. The Obs emptied pretty quickly and there was a tense wait as the crowd gathered and had the exact area of hillside that it had landed on pointed out to them. Once everyone was there, an organised flush saw the bird fly a short way and land on an area of bare hillside. With everyone now watching this amazing spectacle, the bird proceeded to perform a similar manoeuvre several times allowing superb views. 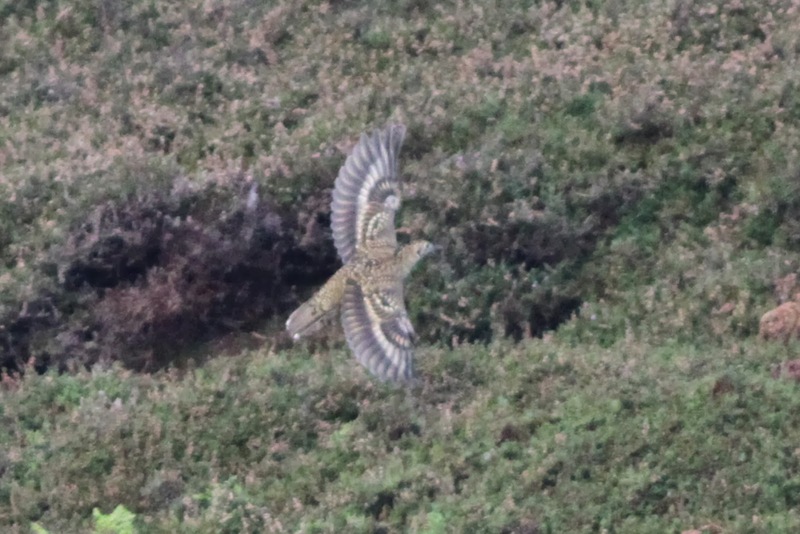 This mega thrush disappeared down a rabbit burrow several times before popping up and regularly sitting in the open, where it remained for a few hours. 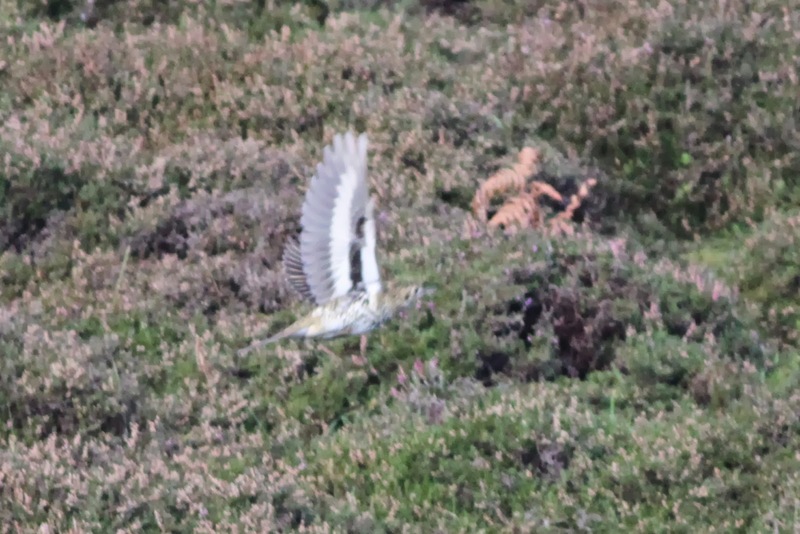 Fair Isle's 12th White's Thrush and first since 2009. It's not very often I'm pleased to see black and white stripes, but this bird really was amazing! Craig Thomas and John Beaumont were out early to make the most of Craig's last day on the island and had been caught out in an unexpected deluge, leading Craig to utter the words'No bird is worth this soaking'. Thirty seconds later, when this flushed from his feet, he freely admitted to changing his mind! With everyone satisfied with the views we retreated to the Obs for breakfast (where Graham had managed to superbly judge the length of time he’d be on the twitch so the sausages were cooked to perfection on our return!) and wondered what the rest of the day would bring. There were clearly a few more thrushes around (although not massive numbers, with just 24 Redwing, 24 Song Thrush, 8 Fieldfare and the first Blackbird of the autumn noted at Log) and a small arrival of common migrants saw Spotted Flycatcher, 2 Chiffchaff, Brambling, 2 North-western Common Redpoll and 6 Woodpigeon amongst the species noted. 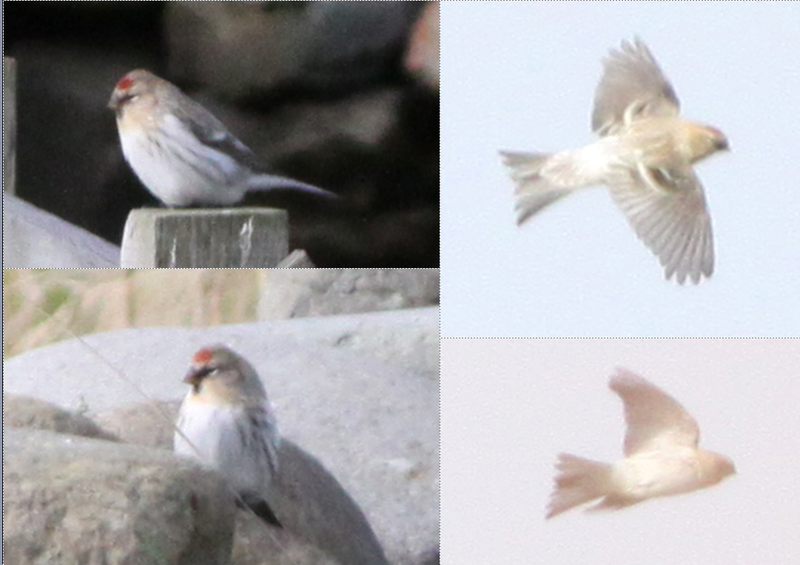 Scarcities were represented by a new Bluethroat at Bull’s Park, 2 Red-breasted Flycatcher in North Raeva, 16 Yellow-browed Warblers (a minimum count, with birds seemingly scattered all over the island), Barred Warblers at Schoolton and Chalet, 2 Common Rosefinch, at least 5 Great Spotted Woodpecker and the lingering Red-backed Shrike at the Obs. After the initial sighting, my views of the Arctic Redpoll were mostly distant, although it was a big, distinctive beast. ﻿Everyone happy? Well, yes, but that doesn’t mean that folk had stopped looking for more and the next message I got was for an interesting locustella at Da Water, with the group who found it being pretty happy it was a Lanceolated Warbler – which it duly turned out to be! 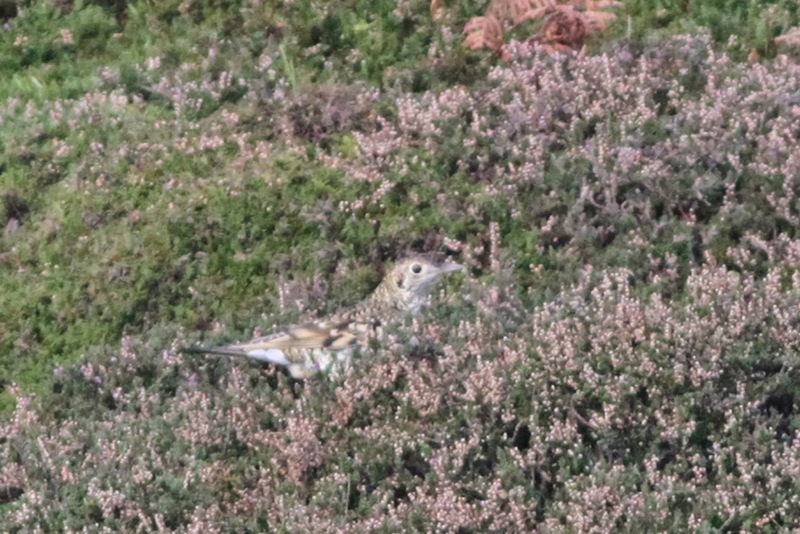 So, just to recap: White’s Thrush, Upland Sandpiper, Lanceolated Warbler, Hornemann’s Arctic Redpoll and Olive-backed Pipit. With more south easterlies forecast for the next few days there’s the chance of more birds to come, but today will take some beating. Great photos and so soon after the find. Looks like it is kicking off.